Recent release “North Side of the Grave” from Page Publishing author Dan Tharp is a book of evocative poems reflecting upon the serendipity of romance and a myriad of people who have touched his life. Dan Tharp, a native of western Oklahoma currently residing in Riverside County, California, has completed his book “North Side of the Grave”: an engrossing collection of poetry exploring the ebb and flow of his most significant relationships. Published by New York City-based Page Publishing, Dan Tharp’s book is a collection of poems capturing both the heady joys of falling in love, the despair when that feeling begins to slip away, and the comfort of knowing love can withstand the challenges of time. 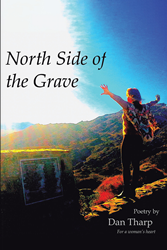 Readers who wish to experience this lyrical work can purchase “North Side of the Grave” at bookstores everywhere, or online at the Apple iTunes store, Amazon, Google Play, or Barnes and Noble.